SPIRITUALISM-VISISTADVAITA-MODIFIED NON-DUALISM THEORY OF RAMANUJACHARYA ( c. 1017 – c. 1137 ). WHAT IS THE RELATIONSHIP BETWEEN GOD, MATTER, AND INDIVIDUAL SOUL? 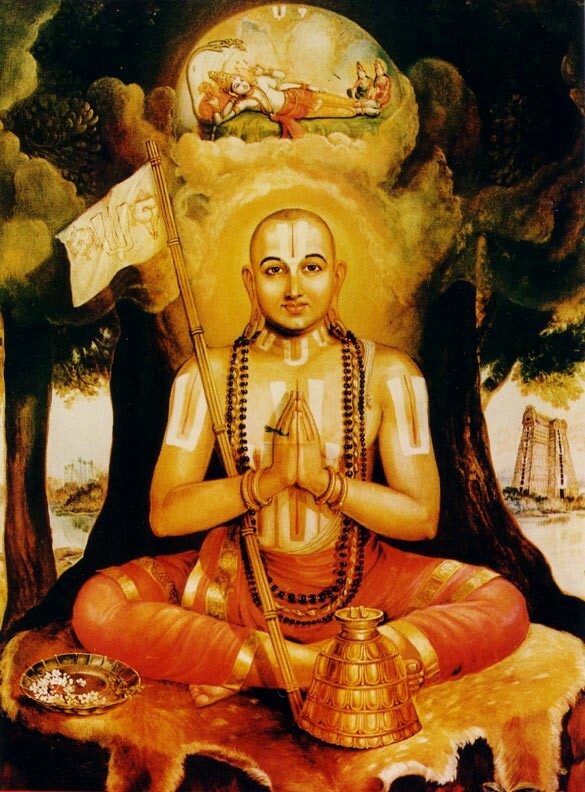 Ramanujacharya is recognized as the foremost Indian thinker who adhered to the Vedantic system of Indian thought like Adi Shankara who was the first to propose the “Unqualified Non-Dualism, or Advaita” to explain the relationship between God, matter, and man. He is the antithesis of Shankara. He opposed the monistic system of Vedanta of Shankara for it offers no room for a personal God. Both Shankara and Ramanuja have derived a system of thought that is based on the interpretation of the Upanishads, the Brahma Sutras, and the Bhagavad Gita. Ramanuja provided an intellectual and a philosophical basis for the practice of devotional worship of God in the Indian tradition called “BHAKTI.” He taught that the worship of a personal God and the union of the Individual Soul with the personal God is an essential part of the doctrines of the Upanishads or Vedanta. Both Shankara, and Ramanuja may have shared a common belief in the Indian tradition that describes the transmigration of the Individual Soul through the experience called “SAMSARA”, which is a cycle of birth, death, and rebirth that is associated with the human body in which the Soul is embodied. Both of them aspire to attain ‘Final Release’ of the embodied Individual Soul from transmigration when it reaches its goal, or the destination. Shankara claimed that the impersonal “BRAHMAN” as the Ultimate Reality, and further stressed that there is no separation or dualism between the Individual Soul and the impersonal Brahman or the Divine Soul. As a theory, Shankara’s Unqualified Nonduality does not demand any ritualistic worship of God. Ramanuja identified the destination, or goal to be attained by the Individual Soul as that of a personal God, a God that he knows by the name of Lord Vishnu. While Shankara had proposed that the material world, and the universe is unreal as it is a mere product of sense experience, a perception caused by “ILLUSION”, or “MAYA.” In Shankara’s view, the understanding of the material world, and the universe leads to ignorance, and not any real knowledge as man has no capacity to overcome the power of illusion. Ramanuja emphasized that the phenomenal world is “real” and that it provides real knowledge. He held the opinion that discursive thought is necessary in man’s search for the ultimate truths. He held that the exigencies of daily life are compatible with the life of the Spirit. Ramanuja allowed the urge for devotional worship(BHAKTI) into his doctrine of Salvation. He combined religious practices of ritualistic worship service with the pursuits of philosophy. He came to these conclusions by accepting the reality of three distinct orders; 1. Matter, 2. Soul, and 3. God. He concedes that there is nonduality(ADVAITA), or an ultimate identity of the three orders. But, this nonduality is asserted by God who is modified(“VISISTA”) by the orders of Matter and Soul that He created. God has modified His own status and nature by causing the birth of Matter and Individual Soul. The analogy used is; just as the human body modifies the Soul, has no separate existence from it, and yet is different from it; similarly, the orders of Matter and Soul constitute God’s body, modifying it, and yet have no separate existence from it. The goal of the Individual Soul is to serve God just as the human body serves the Soul. All the phenomenal world is a manifestation of the glory of God or Lord Vishnu and is described as “VIBHUTI”, or the Infinite Glories of the Supreme Lord. Using contemplation of God, and devotional worship service, man seeks the “RELEASE” of the Individual Soul by God’s grace that remains active in man’s quest. While God’s grace is very powerful, man may have to unconditionally surrender or submit himself to the power of God’s grace. I would be happy to further examine the issue of the three distinct orders of Matter, Soul, and God and arrive at an understanding of their relationship.